What a massive week we have here at TGIF Challenges!!! This week we are celebrating our 100th challenge!!! 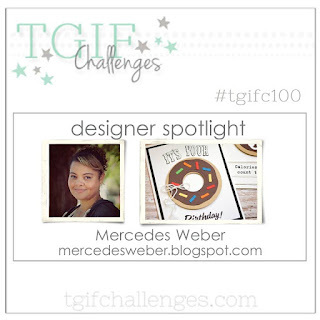 To commemorate and celebrate this fantastic achievement we are highlighting the founder of TGIF, Mercedes Weber. After checking out Mercedes blog and her creations I think I've channeled my inner 'Mercedes'. 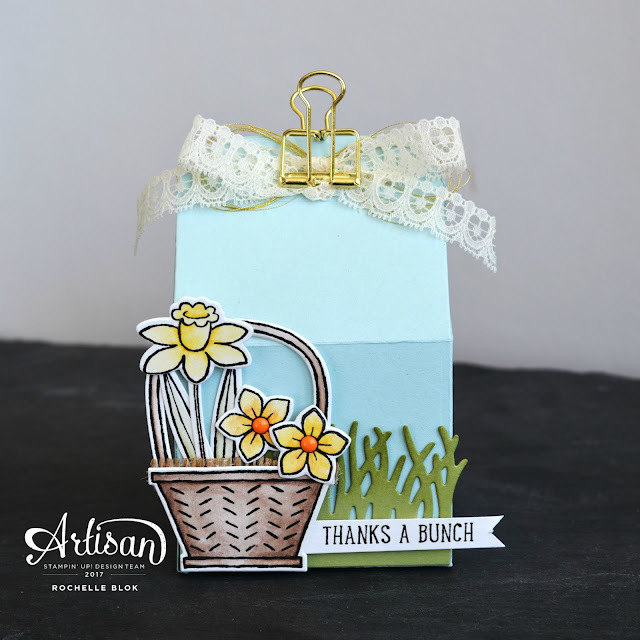 The things I noticed about Mercedes creations is that she uses lots of doilies, glimmer paper, twine and thread. 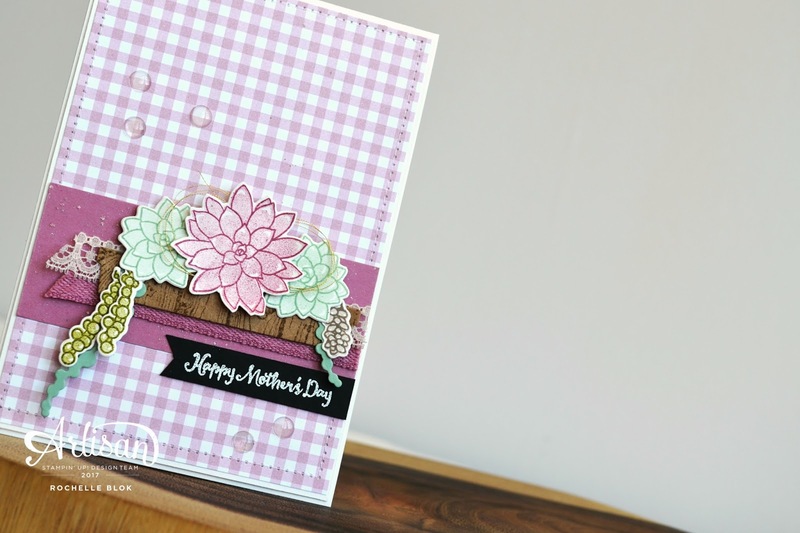 I loved one of her most recent creations with the scrunched up black and white stripe DSP, from the Pop of Pink pack, so that is where I thought I would start. 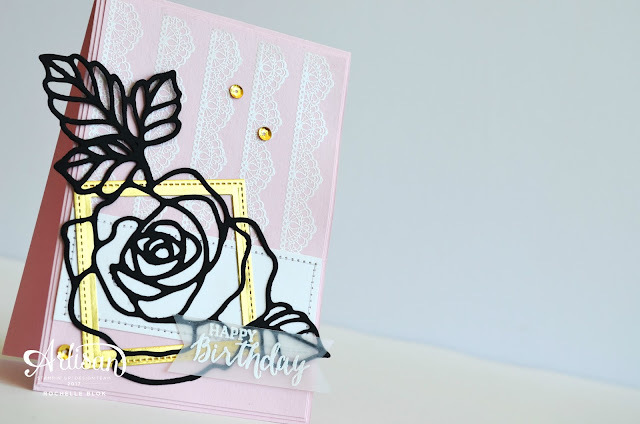 To make this card a bit more my own with a Mercedes feel I flicked Gold Wink of Stella over the DSP layer and then adhered that beautiful Delicate White Doily in the middle. 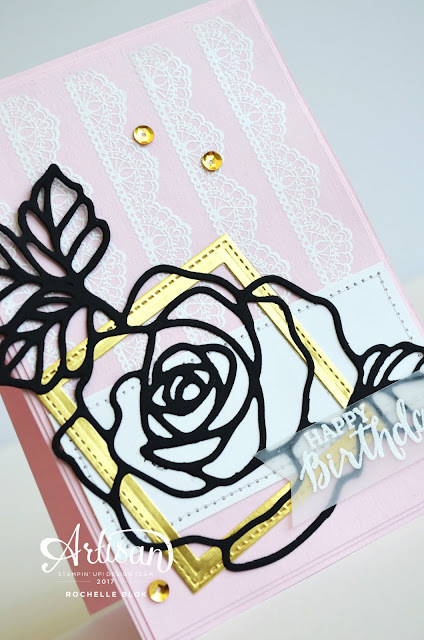 Next then I wrapped some Flirty Flamingo Ribbon and Gold Metallic Thread around the card layer and then added the Gold Foil Stitched Shapes circle and the Fabulous Foil Designer Acetate for some added embellishment. I finished off the card with the big sentiment from Scenic Sayings and the 'Happy Birthday' from Thoughtful Banners. To get I shinny sheen on the 'Hey there, friend' I first inked the stamp with Versamark ink and then with Archival Basic Black ink. 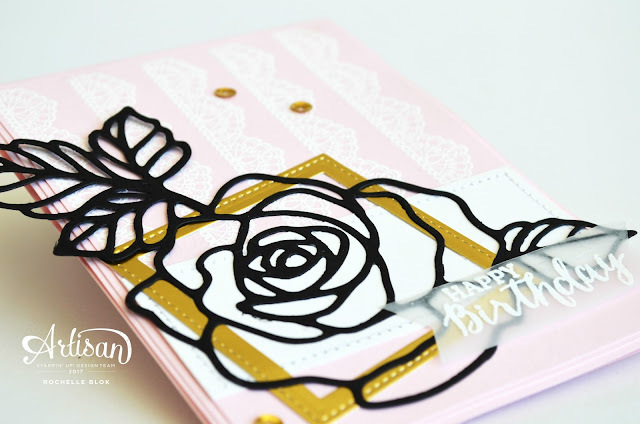 Once I stamped the stamp I quickly poured over Clear Stampin' Emboss powder and heat set it for that shinny look. All finished off with some Gold Glimmer Paper and some Black sequins from the Metallics Sequin Assortment. 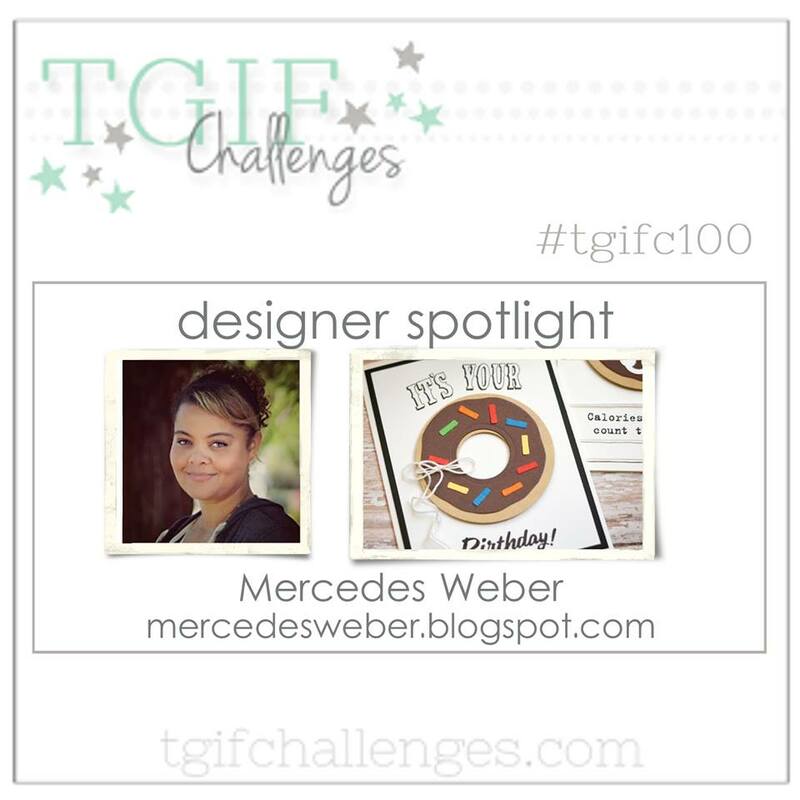 I hope that you like my 'inspired by Mercedes' creation and I'm so looking forward to seeing what you come up with for this fabulous challenge. Make sure that you check out what the rest of the TGIF Challenge team have created this week. Its amazing!! 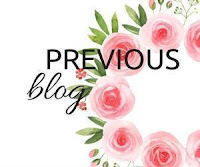 Here is a quick link to everyone's blog to see what they have done! 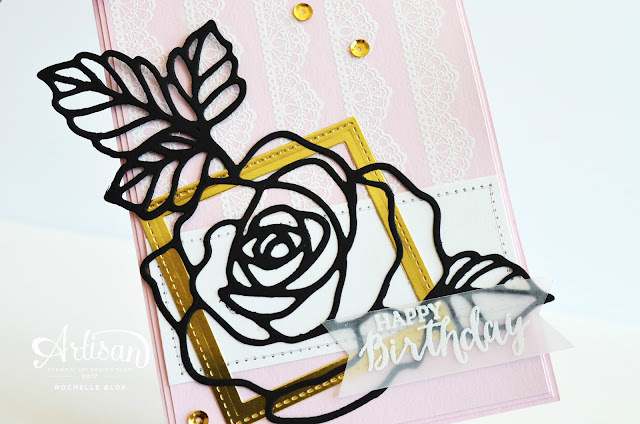 Recreate this creation at home using the following Stampin' Up! products. 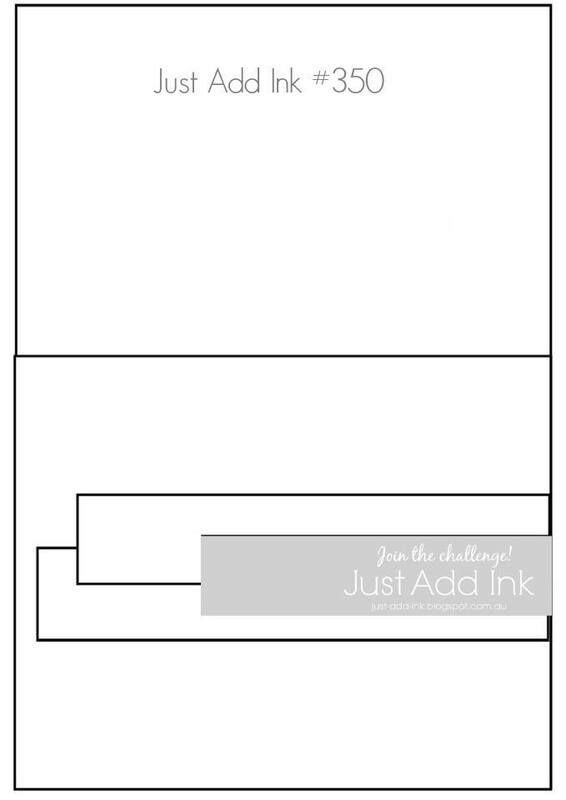 Here's to another Friday and another Just Add Ink card challenge - Just Add Ink #352 - Just Add Colour Combo. Its fun and bright with a little hint of neutrals. 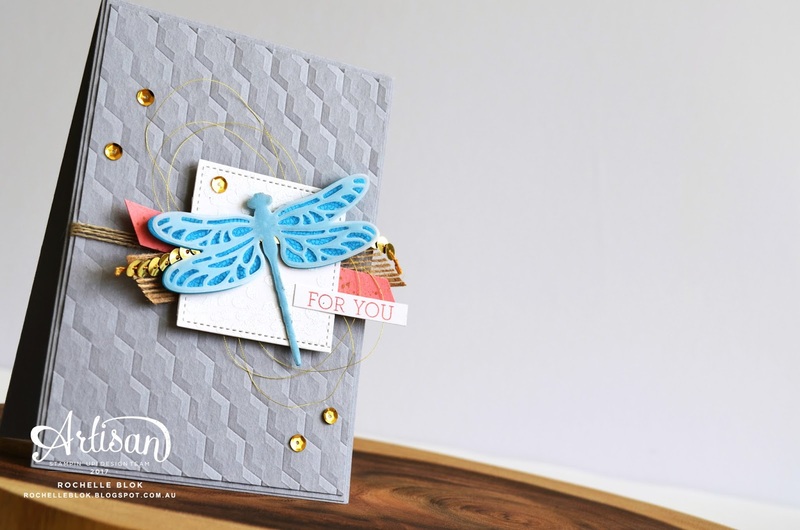 I've incorporated this fun colour combo with the Dragonfly Dreams stamp set and some other fun products from the 2017 Occasions Catalogue. 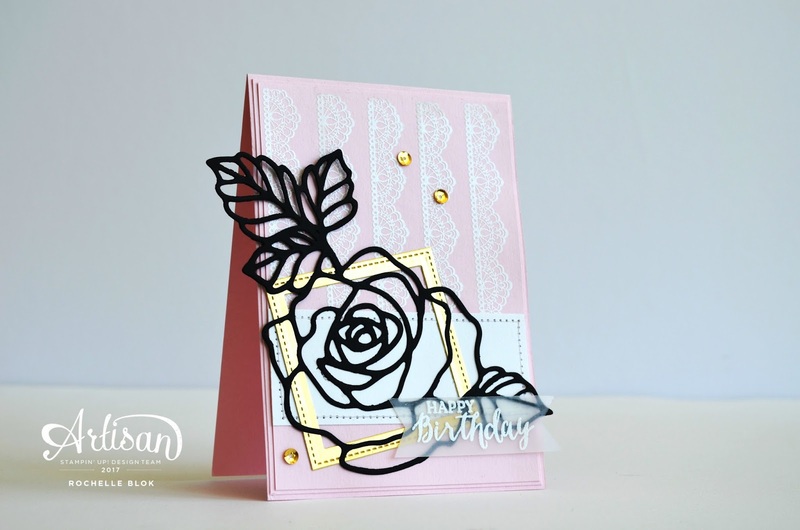 I made three attempts at this card all with a different base layer until I was happy with the result. It all wasn't working for a bit there and was doing my head in! I usually like to have a white base layer on my cards and I did start with that but I felt with the white, Shimmery White of course, that it was too stark as a base layer as compared to the Smoky Slate. Loving that grey embossed base. 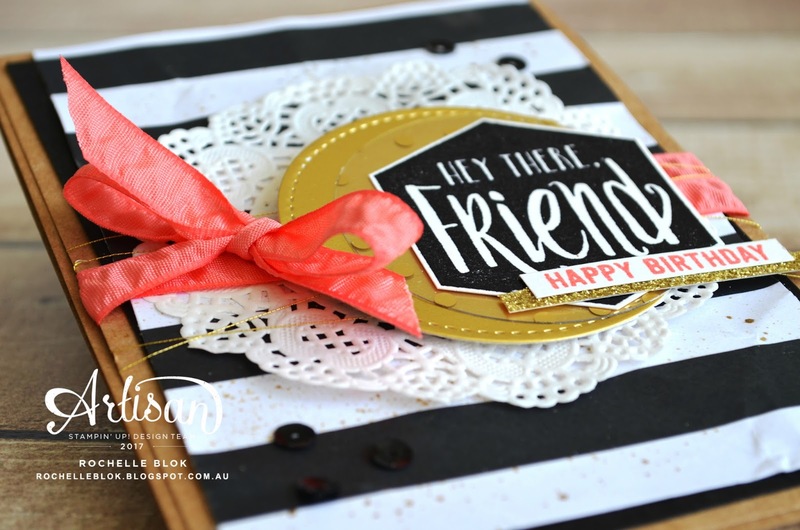 Even though the Hexagons Dynamic Textured Impressions Embossing Folder is in the Urban Underground Suite in the 2017 Occasions Catalogue, which is very much geared towards the males, you don't have to use it just on masculine cards. I love it here mixed with the prettiness of the Dragonfly Dreams Stamp set and the Flirty Flamingo and Tempting Turquoise colours which are very pretty. It may be hard to see but I've used the 'dots' image from the Dragonfly Dreams stamp set for a bit of white on white colouring. 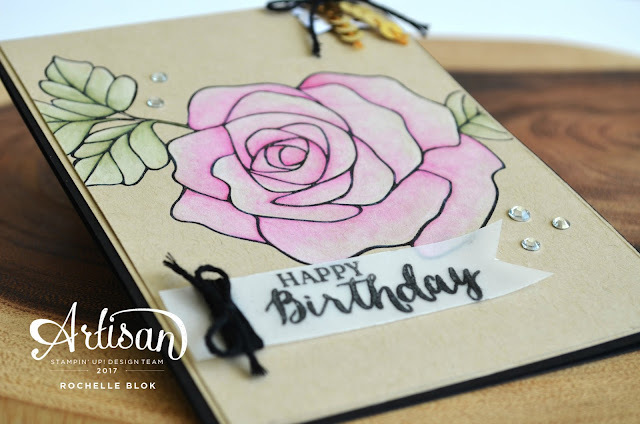 The Stitched Shapes Square is cut out of Shimmery White cardstock and then I've used White Stampin' Embossing powder to heat emboss the dots. Give it a soft and subtle look. The dragonfly has been stamped with Versamark ink and then heat embossed with Clear Stampin' Emboss powder. 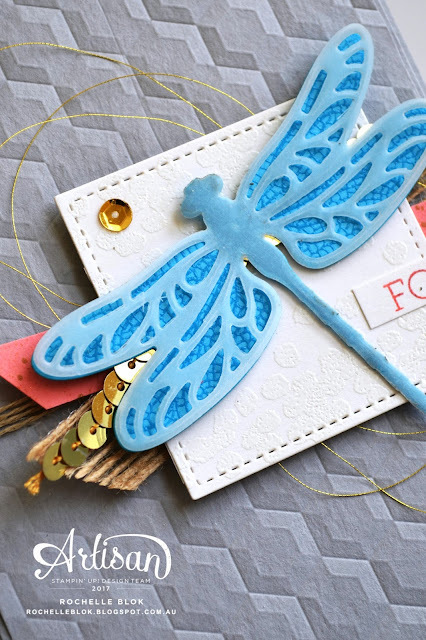 You still get that bright Tempting Turquoise colour and with the Clear Stampin' Embossing it give is a shiny look as well. All finished off with some ribbon, trim, sequins and thread. Some of my favourite embellishments. So pretty! Head on over to Just Add Ink to see what the rest of the incredible design team have to inspire you. They have put their crafting caps on this week and really knocked this colour combo out of the park! These gals are just so clever! 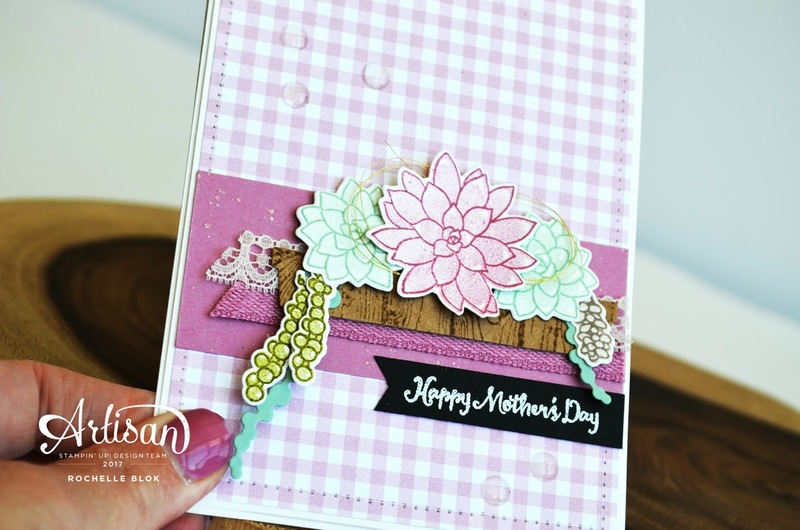 Check out all the details there on how you can enter your card and we hope to see a creation from you. Recreate this creation at home using the following Stampin' Up! products. Click on the images below to see product information and to shop from my online store. Hello... Its Me ... Just seen a few pics on Facebook of some of my Melbourne friends that went to see Adele in concert here last night, sadly I was not one of them but I now have that song stuck in my head. Hello. Hope you are well from where ever you are visiting from. 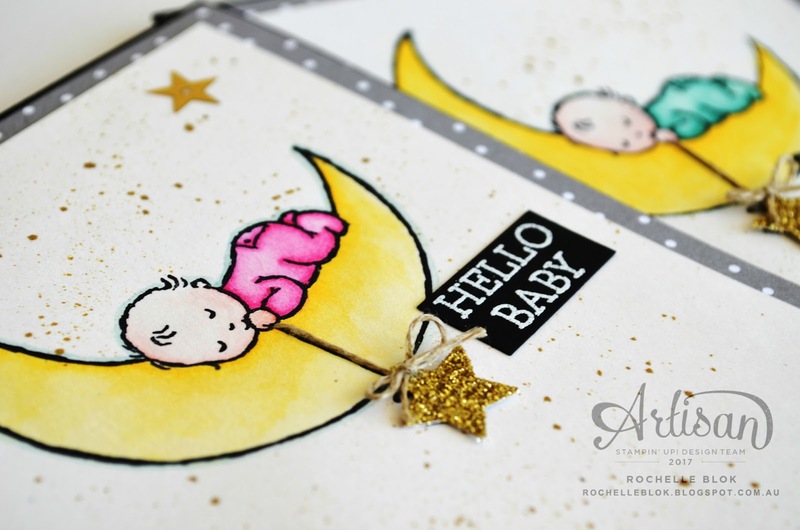 Welcome to another Stamp Review Crew Blog Hop. This hop we are 'reviewing' a very popular set at the moment, Oh So Succulent. There are loads of fabulous ideas out there and I hope that in this hop we can show you something different to do with this amazing stamp set. A few fabulous things about this set is 1. 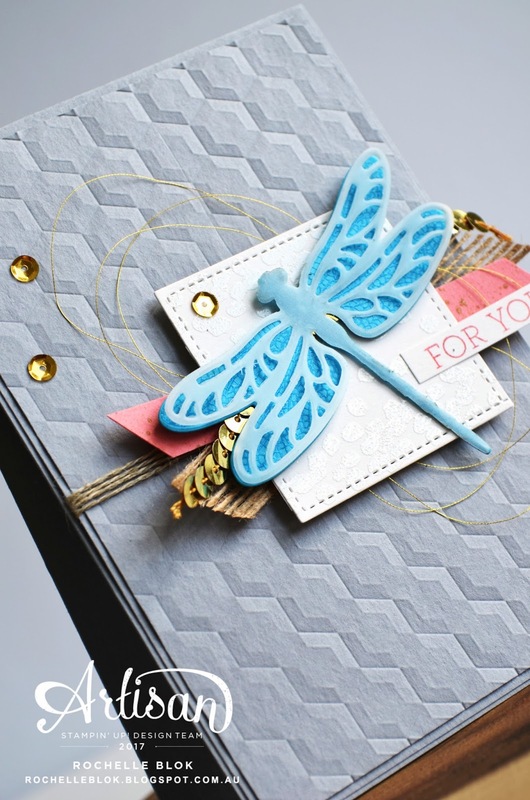 It's a two-step stamp set, so the fabulous images layered together make for some fabulous creations. 2. It has co-ordinating Framelits. BooYeah! No fussy cutting! Love that! 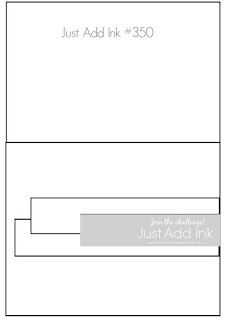 3.Becuase you can get Framelits with this stamp set, you can get both at a 10% off bundle price. Savings!! 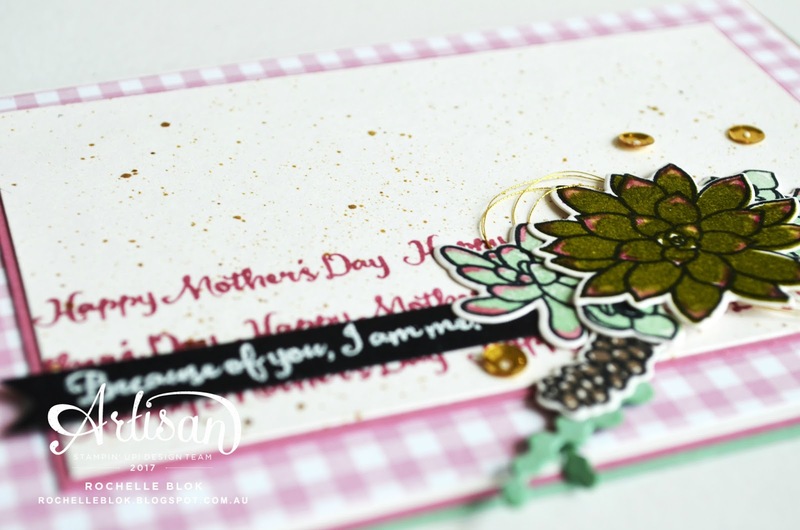 For my card today I've used some of the Mother's Day sentiments for a fun background and then added a succulent cluster on the side. I've used the colours Old Olive, Mint Macaron and Tip Top Taupe for the Succulents and then added some colour on the edges of them with Rich Razzleberry and Sweet Sugarplum. 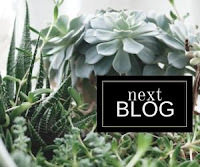 The colours on the edges just give the succulents some added dimension and make them look more life like. 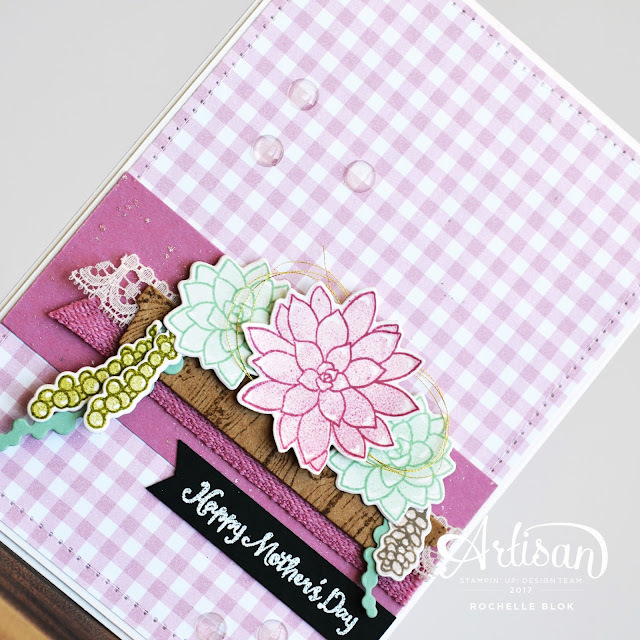 I'm loving that Sweet Sugarplum gingham DSP form the Succulent Garden DSP. So soft and pretty. I could so easily just have a whole packet of that design and I would be happy with that. Pretty! To finish off my card I've flicked some Gold Wink Of Stella over the Shimmery White layer and then added some Gold Metallic Thread and some Gold Sequins from the Metallics Assortment sequins. Next on to fellow the amazing Martha Inchley, who I'm sure will WOW you with her creation. Welcome, Welcome! Welcome to another TGIF Challenge. Be prepared for a super sweet challenge this week as we do all things babies. Awww. I've pulled out the Watercolour Pencils (yup, again! Just love them!) 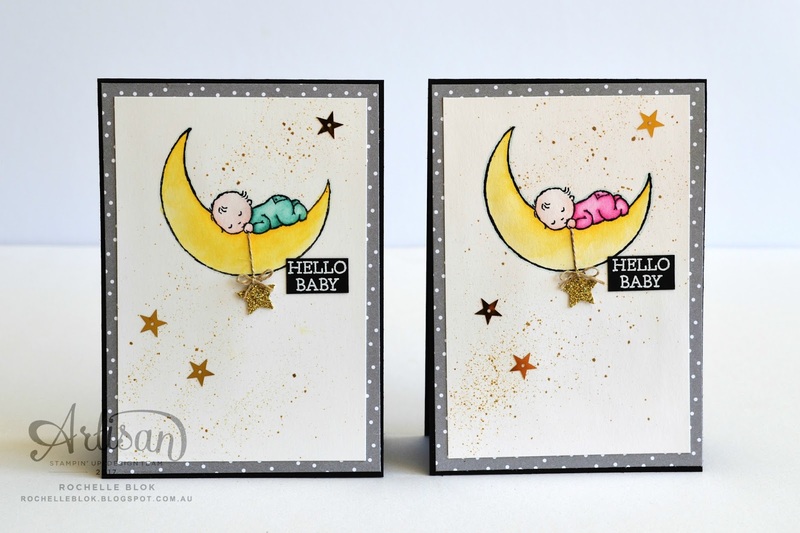 and the oh so gorgeous, oh so adorable stamp set Moon Baby. Isn't this just the cutest stamp set going around. The images are super sweet and make your heart melt with their cuteness. I'm a bit of a sucker for cute sets and more so cute sets that you can colour. Bonus! I've gone with the traditional pink for a girl card but I do love the Bermuda Bay, more aqua colour for a boy card. While I do like blue for boys, and yes I know that is very traditional, I'm loving the Bermuda Bay colour more for a boy. Just thinking when my eldest was born nearly 14 years ago (eeek, that long ago) he had a growsuit (onsie) in exactly the same colour and I loved it on him. I've the pencils that I used to colour the images were Daffodil Delight, Bermuda Bay, Melon Mambo and for the skin tone a very light colouring of Calypso Coral. Once the image was coloured I covered it over with a cut out of the same image and then flicked Gold Wink Of Stella. By masking the coloured image I then could make sure that none of the WOS got on to the coloured image where I didn't want it. 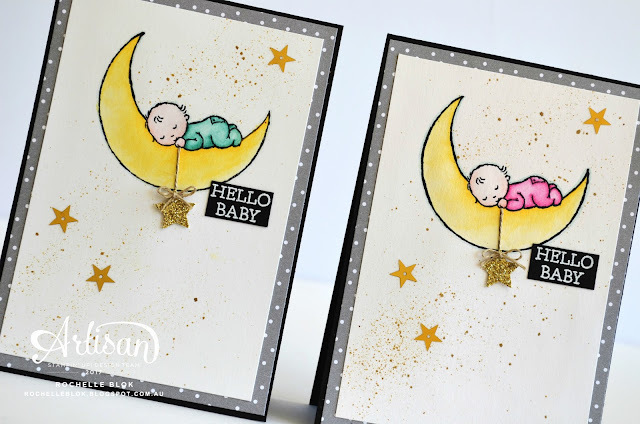 Around the stamped image, to give it a slight shadow I went around it with Soft Sky using an Aqua Painter. 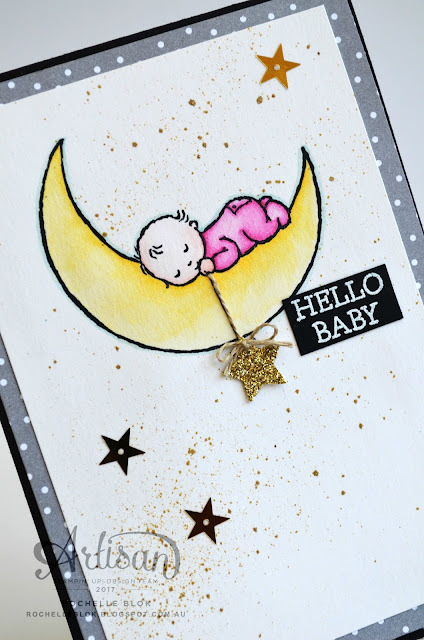 The "Hello Baby' has been heat embossed with White Stampin' Emboss Powder on to Basic Black Cardstock and then I've finished it off with some Linen thread, Gold Glimmer Paper punched out with a retired star punch, and some stars from the Metallics Sequins Assortment. Just a couple of fun baby cards ready to give out to the next few people having a baby. Make sure that you head on over to TGIF Challenges to see what the rest of the incredible design team have to inspire you. Loads of fabulous ideas. These gals are just so clever! Check out all the details there on how you can enter your card and we hope to see a creation from you. Hello there stamping friends!! So happy you could join us today! 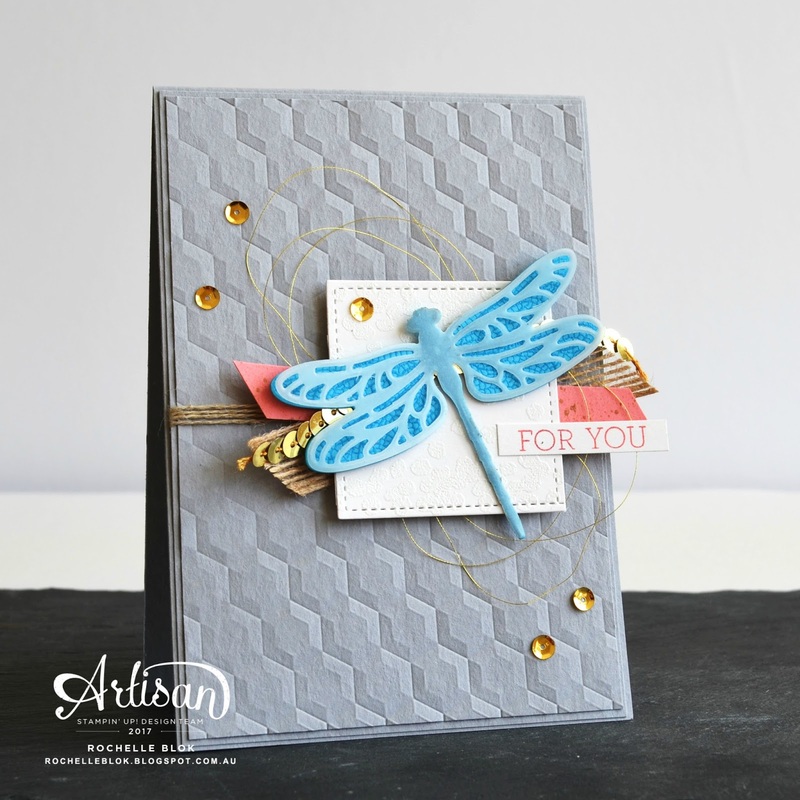 This week the Artisan Design Team have been asked to feature either Dragonfly Dreams or Basket Bunch. Two fabulous sets but so very different so I hope that you get loads of ideas from this hop for both sets. Basket Bunch is very much geared towards Easter but I love the daffodils in this set. It may be Autumn here in Australia but when Winter ends and Spring does come around I love when all the daffodils are in bloom and all that bright yellow colour. 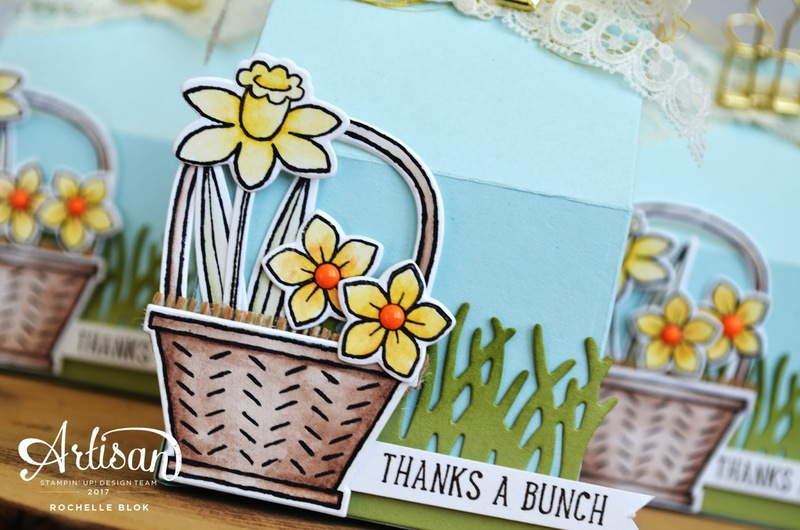 And those daffodils make for some gorgeous bright colour to your creations. All the images have been coloured using the Watercolour Pencils and then I used an Aqua painter to 'pull' out and 'wash' the colour. I'm loving the contrast from the Soft Sky cardstock of the Bakers Box to the Pear Pizzazz 'grass' and then the Daffodil Delight and Early Espresso colours in the basket and daffodils. I put some pieces of the 5/8" Burlap Ribbon vertically to add some texture to the basket. To do this I put a strip of Tear & Tape across the top edge of the basket and then put down some small pieces of the 5/8" Burlap Ribbon and trimmed it to fit. To give the smaller daffodils some brighter colour I first coloured with the Daffodil Delight watercolour pencil and then added a little bit of the Pumpkin Pie pencil for some added depth. Loving that deeper yellow colour. 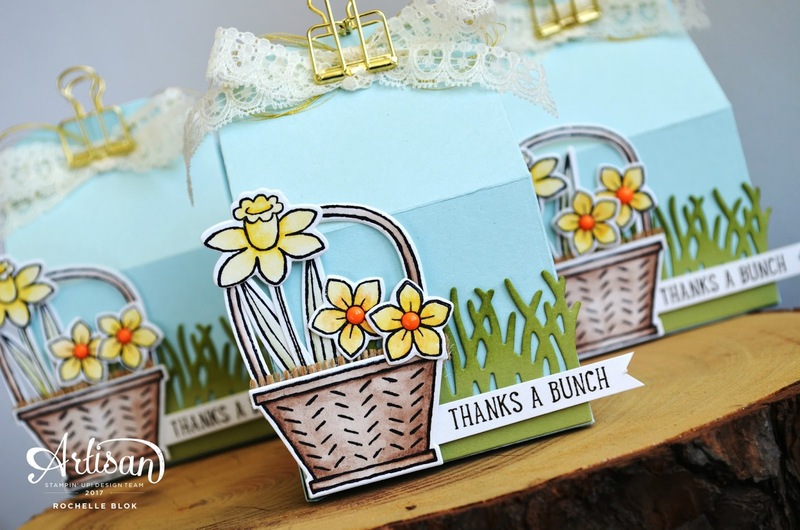 I hope that you've enjoyed my little Daffodil Gift Boxes and got some more ideas for the Basket Bunch stamp set. Next on to the ever colourful and ever amazing, Shannon Lane, in Canada. Did I say I love her work? Yay it's Friday! And Yay is Just Add Ink time! Its Just Add Ink Sketch time. Woohoo! You all know me and know that I love a sketch and am loving this one too. 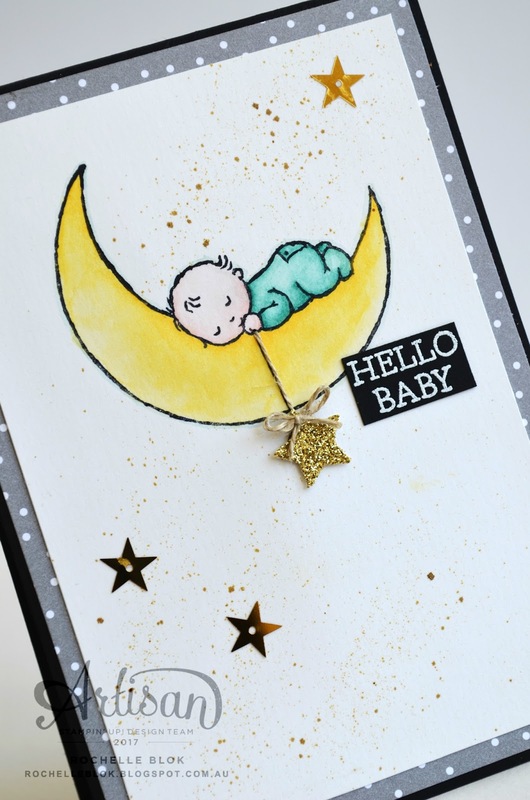 I've gone with some of the products from the Stampin' Up! 2017 Occasions catalogue in the Succulent Garden Suite. Gorgeous. I've seen this gingham design from the Succulent Garden DSP on many other creations and have loved it every time. It's just so pretty and time for me to use it now too. I've pulled out the sewing machine again for some real stitching not just some faux stitching. 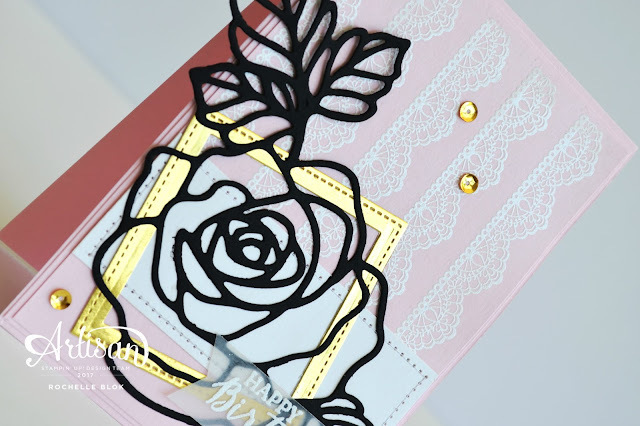 I find the sewing just adds that extra element to any card to make it that little bit more special. The best thing about this gingham DSP is that you can follow the straight lines on the DSP for (mostly) straight sewing. 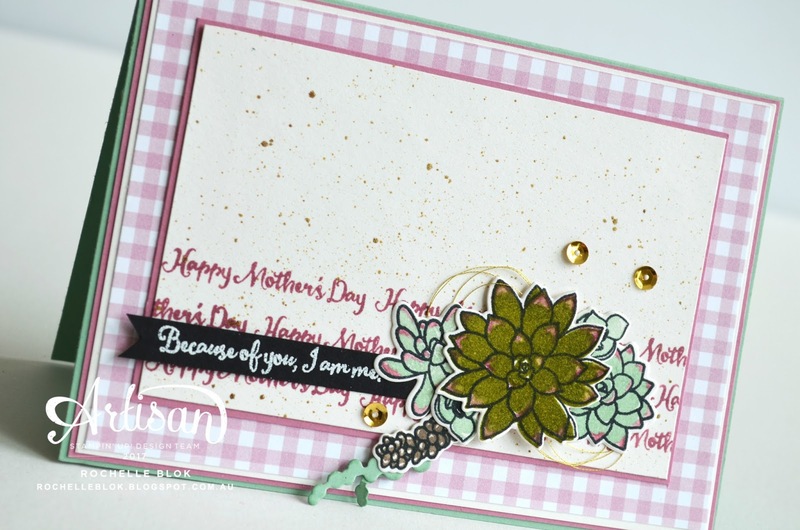 This is my first play with the Oh So Succulent Stamp set and Succulent Framelit Dies. Another of those Two-Step stamp sets and I'm loving it. Layering of solid and finer images for a fun look. The colours that I've gone with today are all found in the DSP and they co-ordinate so well together. Sweet Sugarplum, Mint Macaron, Tip Top Taupe, Old Olive and Whisper White. The DSP colour list does say Whisper White but I've gone with my white go to, Shimmery White. I just love Shimmery White. I don't think I can go back to just plain Whisper White anymore. Sorry Whisper White. On the Sweet Sugarplum cardstock panel I've flicked Clear Wink Of Stella over it for a subtle shimmery splatter. Its hard to see in the photo but the Clear WOS is s beautiful look. Check out my nail polish. Does that look like Sweet Sugarplum or what? Very close to anyway. HA! I didn't choose it cause it looked like Sweet Sugarplum, I just liked the colour. 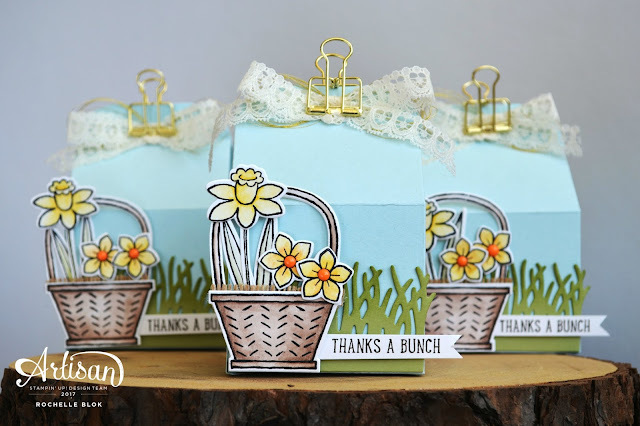 Maybe I had Stampin' Up! colours in my subconscious when I chose it. If you follow me on Instagram, you can see the comparison of my nail polish and Sweet Sugarplum here. Pretty funny, I thought! I've really loved creating this card and using the sketch for this creation. I hope that I've inspired to to get crafting with this sketch. Head on over to Just Add Ink to see what the rest of the incredible design team have to inspire you. Loads of fabulous ideas. These gals are just so clever! Check out all the details there on how you can enter your card and we hope to see a creation from you. 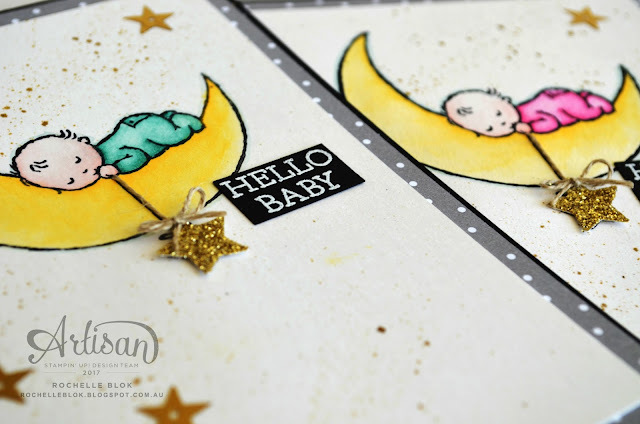 Today I'm playing along over at What Will You Stamp? 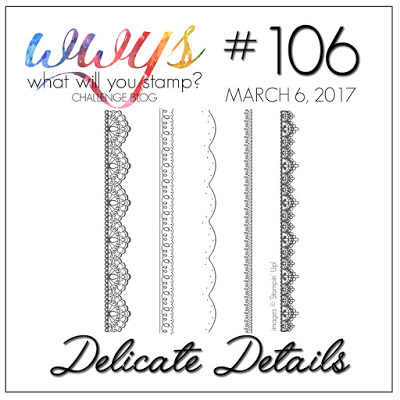 #WWYS106 with their challenge this week to use the beautiful Sale-a-bration stamp set - Delicate Details. 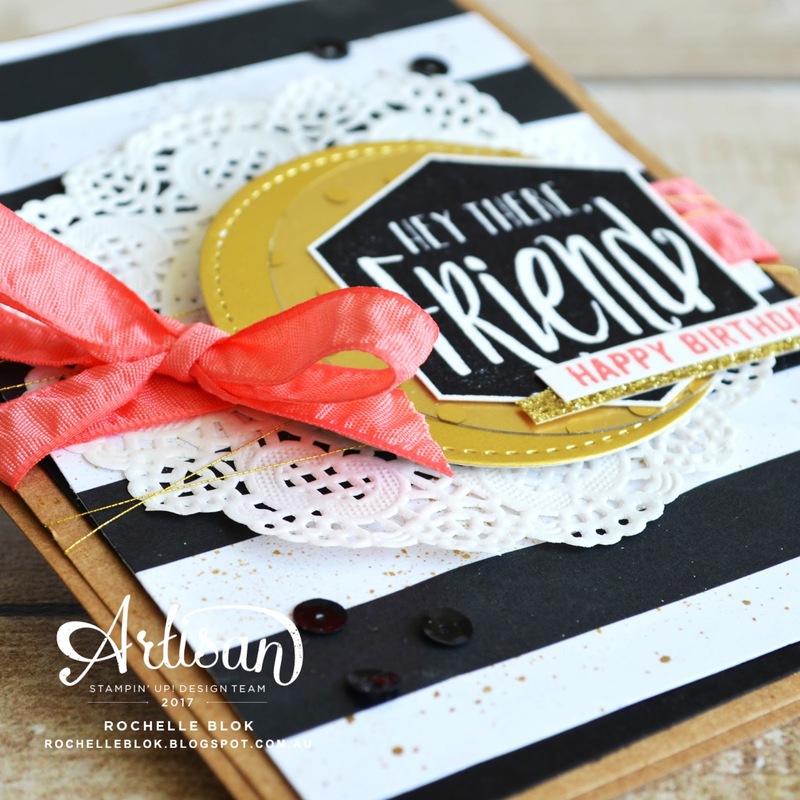 If you haven't got this freebie yet from the Sale-a-bration promotion you've still got time. Just ask me how you can get your hands on this set. But hurry!! My fabulous Stampin' Up! Upline and friend, Liv Ingle, is the newest member of the What Will You Stamp? team and I'm wanting to support her by participating in the challenge with her first design team assignment. Liv has been such a huge supporter of all my design team endeavours and now its time to support and encourage her with the WWYS Design Team . What better stamp set to join in with than the Delicate Details stamp set. It's pretty, its delicate, it lacy, its gorgeous, all the things I love in a stamp set. I've teamed it up with a colour combination that is equally as pretty, Pink Pirouette, Whisper White, Basic Black and a touch of Gold. I've started by stamping and heat embossing White Stampin' Emboss Powder and to have the Lacy stamp image to go vertical instead of horizontal. Loving that lacy image running down the card. Once the Delicate Details background was done then it was adding all the other elements to put the card together. This card came together very quickly actually. 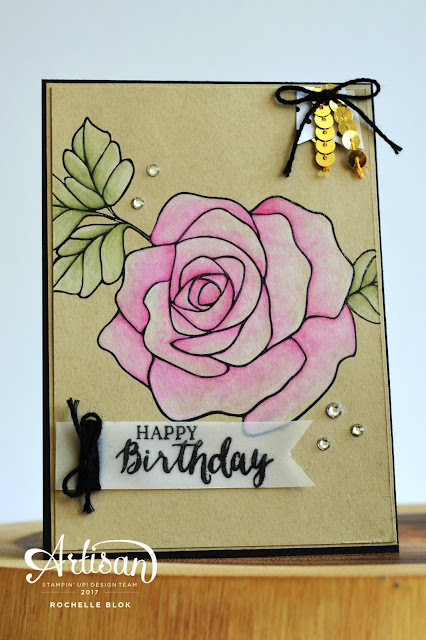 Most of the elements on the card were left over pieces from other more recent creations that I was going to use but decided against and then put them in my scrap bits and pieces pile. Really should get a container for these as most of them are just floating about in a pile on my desk. Off to K-mart I go! Don't throw away all those scrap bits and pieces! They may just come in handy down the track on another creation. The pink, black and white combo is such a gorgeous and classic combination. The softness of the pink and white starts for a real pretty creation and then you are hit with that bold, dark black that just jumps right off the card. I've finished off the card with a dot of sequins here and there. Just loving the simple elegance of this card. 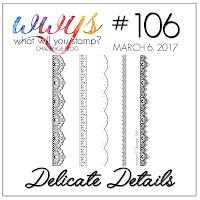 Remember to get the Delicate Details stamp set you need to spend $90 AUD with me on any Stampin' Up! products (not including P&H) and Delicate Details (#143314) is all yours for FREE! Hurry before Sale-a-bration ends on 31st March 2017! For all the details contact me TODAY! Why hello there!! Welcome to the first Stamp Review Crew Blog hop for March. What, March already?? Christmas still feels like yesterday. 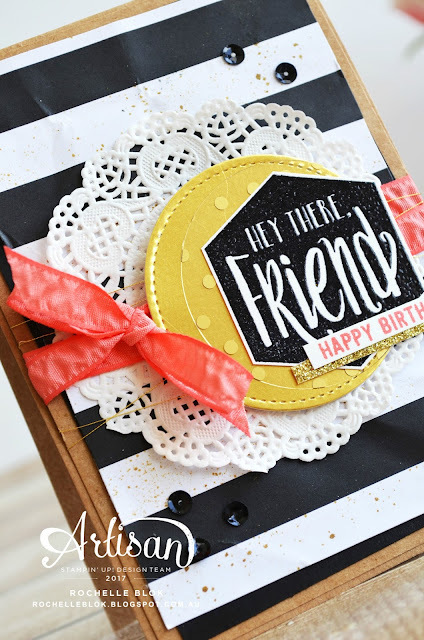 If you are joining us for the first time we are a group of International Stampin' Up! 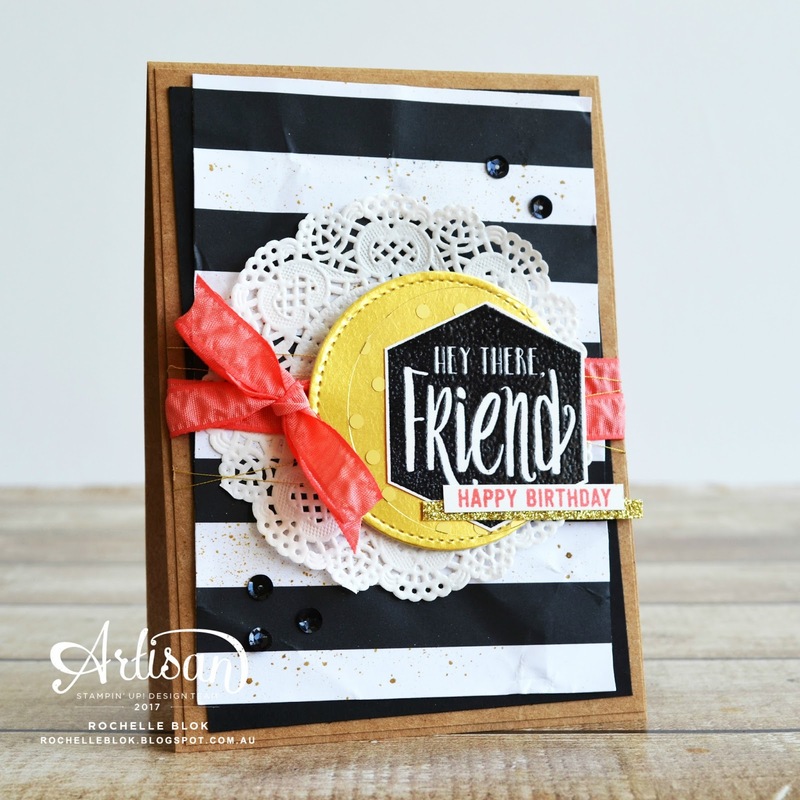 demonstrators that show one Stampin' Up! stamp set at a time, every first and third Monday's of the month. Be sure to make your way around the hop by clicking the next button at the bottom of each post. 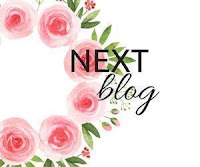 If you get lost along the way click on the banner at the top of each post and that will lead you to the list of hoppers so you can continue seeing all the fabulous creations. 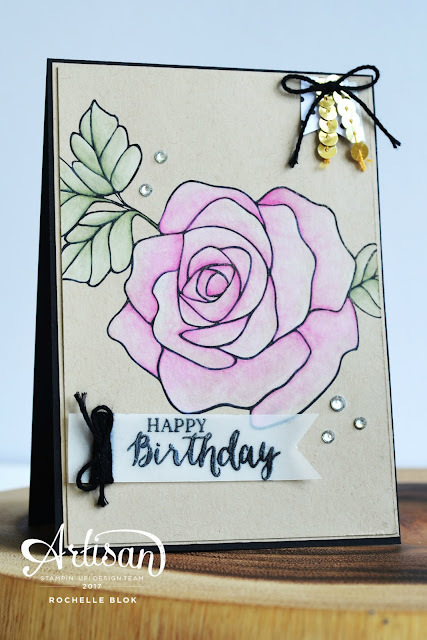 This hope we are using the very beautiful stamp set Rose Wonder. Just stunning! There is also matching thinlits to go with this set, Rose Garden. Love a bit of matchy, matchy! I've only used the stamp set for you today. I did a bit of CASE-ing of myself today and colouring on Crumb Cake cardstock. To see my creation that I Case-d check it out here. 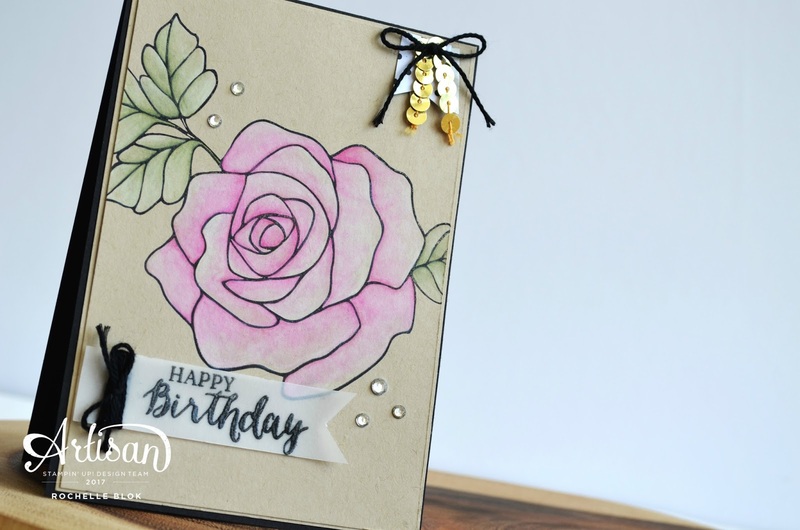 My most favourite thing to do with this set is to stamp that beautiful big rose and just colour way and after a busy weekend away it was so nice to spend some time this morning just colouring away. I could feel myself destressing (spelling?) as the minutes went by. 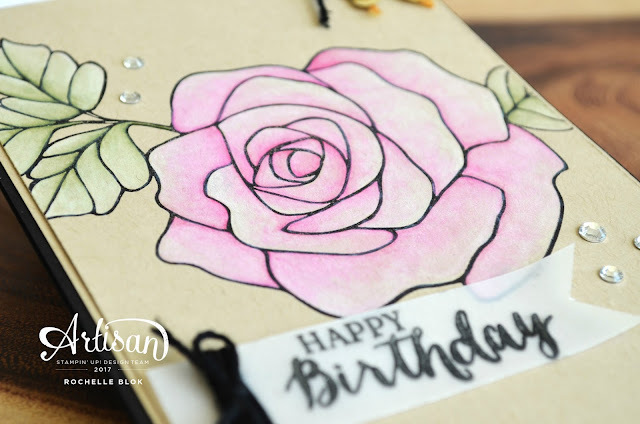 The best way to colour onto Crumb Cake cardstock is to stamp your image and fill in each section with a very thin layer of Whisper White Craft ink with an aqua painter. This like putting down a base coat like when your painting and it also allows you to use a little bit more water than without it. If you went to colour with out the Whisper White layer the cardstock would most definitely pill and ball up. To see how I started check out the Instagram photo I put up this morning at the start of the process. It will give you a better idea of what to do. After the Whisper White layer I used the Watercolour Pencils to add the colour. I first coloured straight on to each section with the Watercolour Pencils and then pulled the colour out with an Aqua painter. Once that first layer was done I went over and did a touch up layer by picking the colour straight off the pencil with the Aqua painter and fixed up the sections or added more colour where needed. Once all finished with the colouring I've finished it off with one of the many sentiments from the set. How beautiful is that script font??!! Just pretty! 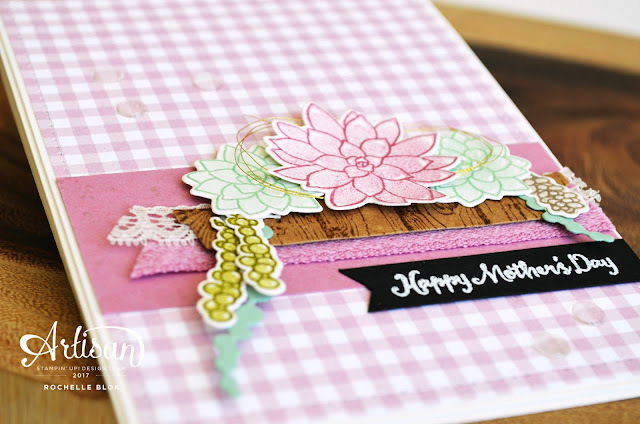 I've also added some trim and embellishments to finish prettying up the card. Next up on the hop is Yapha Mason. Click the next button below to see her beautiful and sparkly creation.